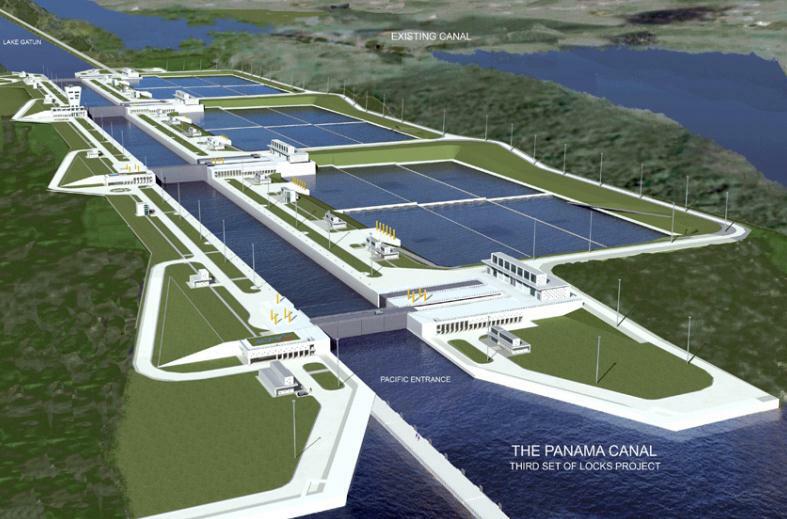 THE PURPOSE OF THIS ADVISORY IS TO INFORM THE SHIPPING COMMUNITY OF THE DEFINITIONS AND REQUIREMENTS APPLICABLE TO ALL VESSELS INTENDING TO TRANSIT THE PANAMA CANAL’S NEW LOCKS. PANAMAX: ALL SUPERS THAT COMPLY WITH THE SIZE AND DRAFT LIMITATIONS OF THE ACTUAL LOCKS; NAMELY, 294.13 METERS IN LENGTH BY 32.31 METERS IN BEAM BY 12.04 METERS TFW DRAFT. NEW PANAMAX: ALL VESSELS WITH DIMENSIONS GREATER THAN PANAMAX OR PANAMAX PLUS THAT COMPLY WITH THE SIZE AND DRAFT LIMITATIONS OF THE NEW LOCKS; NAMELY, 366 METERS IN LENGTH BY 49 METERS IN BEAM BY 15.2 METERS TFW DRAFT. THE MAXIMUM LENGTH FOR INTEGRATED TUG-BARGE (ITB) COMBINATION ACCEPTABLE FOR REGULAR TRANSIT IS 366 METERS OVERALL, INCLUDING THE TUG. A TUG-BARGE COMBINATION MUST TRANSIT TOGETHER AS ONE UNIT WITH THE TUG SUPPLYING PROPELLING POWER. THE MAXIMUM BEAM FOR COMMERCIAL OR NON-COMMERCIAL VESSELS AND THE INTEGRATED TUG-BARGE COMBINATION ACCEPTABLE FOR REGULAR TRANSIT IS 49 METERS, MEASURED AT THE OUTER SURFACE OF THE SHELL PLATE, INCLUDING ALL PROTRUDING STRUCTURES BELOW THE TOP OF THE LOCK WALLS. 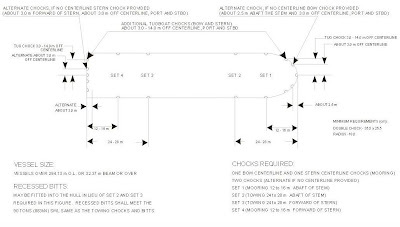 VESSELS THAT CARRY CARGO WITHIN 2.5 CENTIMETERS OR LESS OF THE EXTREME BEAM MUST HAVE APPROVED PROVISIONS, SUCH AS RUBBING BANDS TO PROTECT THE CARGO, SHOULD THE VESSEL REST ALONGSIDE THE WALL WHILE IN THE CHAMBER. THE MAXIMUM BEAM OF 49 METERS MUST NOT BE EXCEEDED BY THE CARGO PROTECTION METHOD. 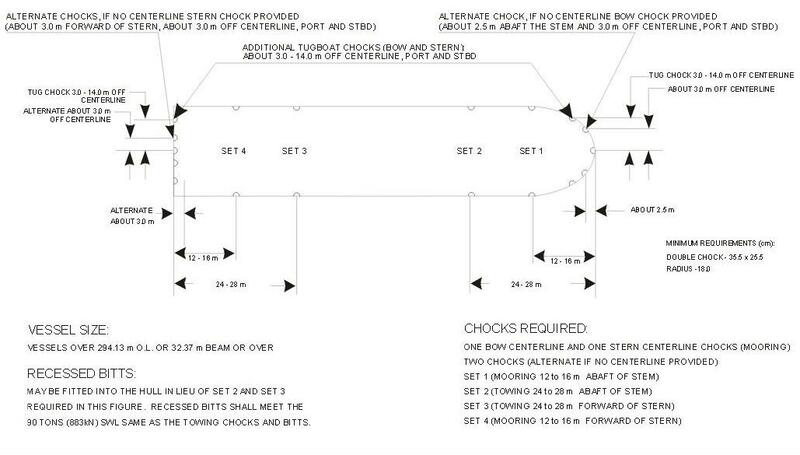 ANYTHING THAT EXTENDS BEYOND A VESSEL’S HULL, EXCEPT FOR THE MAIN ANCHORS, SHALL BE CONSIDERED A PROTRUSION AND SUBJECT TO ALL APPLICABLE REGULATIONS AND LIMITATIONS. THE ACP IS NOT RESPONSIBLE FOR DAMAGES TO PROTRUSIONS, WHETHER PERMANENT OR TEMPORARY. VESSELS WITH PROTRUSIONS MAY BE PERMITTED TO TRANSIT PROVIDED THAT SUCH PROTRUSIONS WILL NOT INTERFERE WITH THE SAFE TRANSIT OF THE VESSEL OR PRESENT A HAZARD TO CANAL STRUCTURES AND APPURTENANCES, AS DETERMINED BY THE EXECUTIVE MANAGER FOR TRANSIT OPERATIONS. BEFORE TRANSIT IS PERMITTED, THE MASTER OF THE VESSEL WILL BE REQUIRED TO COMPLETE A FORM “UNDERTAKING TO RELEASE AND INDEMNIFY” TO EXONERATE AND INDEMNIFY THE ACP FROM LIABILITY IN CASE OF AN ACCIDENT OR DAMAGES SUSTAINED TO OR AS A RESULT OF THESE PROTRUSIONS. VESSELS WITH PERMANENT PROTRUSIONS MUST, PRIOR TO PROCEEDING TO THE CANAL, FURNISH DETAILED INFORMATION REGARDING THE PROTRUSION(S), INCLUDING PLANS AND REQUEST AUTHORIZATION FOR TRANSIT. ADVANCE INFORMATION WILL MINIMIZE THE POSSIBILITY OF DELAYS OR DENIAL OF TRANSIT. FOR DETAILED INFORMATION, CONTACT THE EXECUTIVE MANAGER FOR TRANSIT OPERATIONS. THE MAXIMUM PERMISSIBLE DRAFT FOR CANAL TRANSITS HAS BEEN SET AT 15.2 METERS. TROPICAL FRESH WATER (TFW) AT A GATUN LAKE LEVEL OF 25.91METERS OR HIGHER. GATUN LAKE DENSITY IS 0.9954 TONS /M³ AT 29.4 ºC. THIS PROVIDES A SAFE NAVIGATIONAL MARGIN OF AT LEAST 1.52 METERS OVER CRITICAL ELEVATIONS IN THE NAVIGATIONAL CHANNELS AND A CLEARANCE OVER THE LOCK SILLS OF 3.05 METERS.